Five Great Lakes sailors drowned after their vessel, the schooner-barge Ironton, collided with the bulk carrier Ohio off Lake Huron’s Presque Isle in rough seas in the wee morning hours of September 26, 1894. 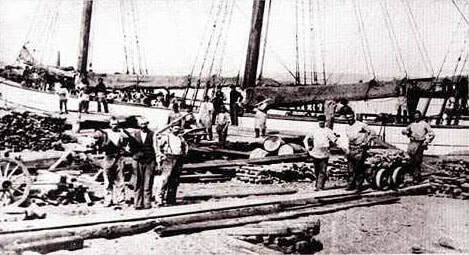 The Ohio, a 202-foot, wooden steamship owned by C. W. Erphicke & Co. of Chicago, was struck broadside by the coal-laden 191-foot Ironton at around 12:30 a.m. A report in a Decatur newspaper stated that the schooner’s prow sliced into the Ohio abreast of the boiler house, opening a 200-square-foot hole to the water’s edge. 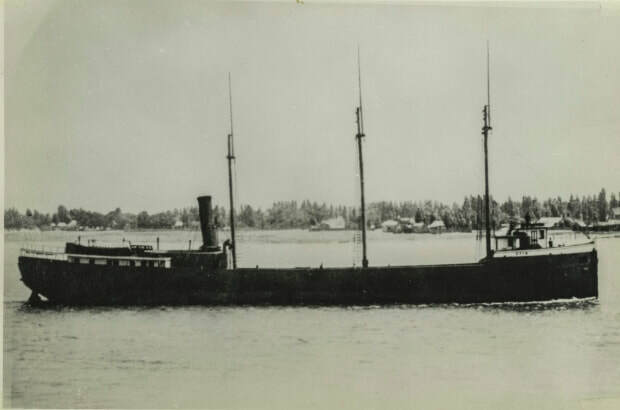 The 19-year-old steamer settled and sank within 30 minutes in about 200 feet of water. Captain John Isbester and his crew of 16 had time to launch the steamer’s life-boats and they were successfully rescued by the Steamer Kershaw, which had the Ironton in tow, and the schooner Moonlight, which also was a consort behind the Kershaw. The Ironton, however, had its sole life-boat, a yawl, crushed in the collision. Consequently when it sank the crew was forced to seize planks and barrels and attempt to swim for Presque Isle, some 15-miles away. Two of the men were rescued by the passing steamer Charles Hebard but five others were lost. The Ohio’s mate, Arnel Hodge, spent two hours in the stormy seas and was nearly dead from exposure when a lookout on the Kershaw spotted him. The lost sailors of the Ironton were not identified in the news clippings of the day. The final trip sheet for the Ohio lasted Ibsester and Hodge, plus the following: Second Mate F. B. Cady, Chief Engineer William Frazier, Second Engineer John Bradley, stewards William Doland and Charles Grinnell, watchmen John Burke and Arthur McGraw, wheelmen D. C. Anderson and D. D. Ball, firemen Frank Cassidy and Frank Fullerton and deck hands Thomas Crossnell and Henry Schiller. The wreck of the Ohio was only recently discovered by divers for the Thunder Bay National Marine Sanctuary. Because of the depth of the cold freshwater, the wreck is reportedly well-preserved. Plans are being made to list it on the National Register of Historic Places. The Ironton is yet to be found. The Ohio was built at Huron, Ohio, in 1875. The Ironton was launched at Buffalo, N.Y. in 1873.